Broccoli Slaw with a Twist | What's Cooking at the Genua's? Here it is another July 4th and of course most people will be having the usual mayo-laden salads. Don’t get me wrong, I love those salads. If I could eat potato salad every day I would! But I have to be more conscious of things these days if I want to lose any weight. 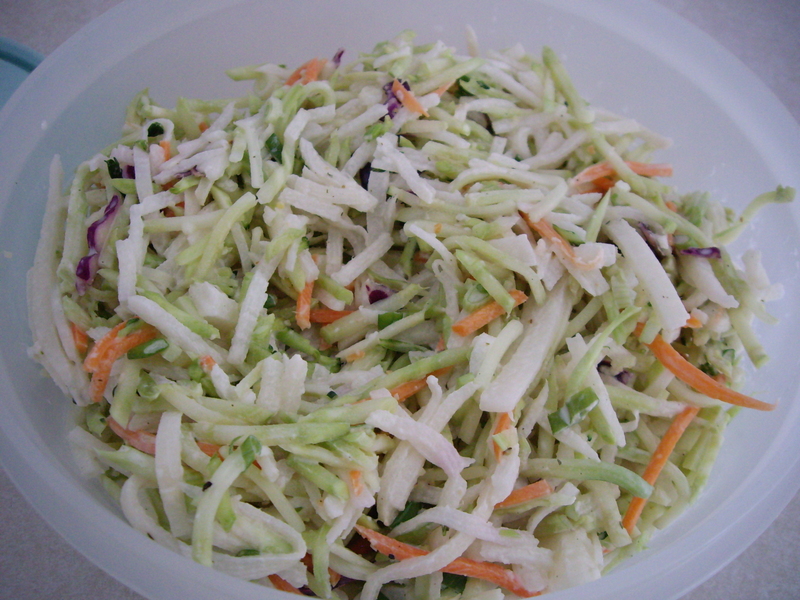 So I came up with this light and crunchy slaw. The twist in this slaw is jicama. I know many of you do know what jicama is but I’m sure there are many who don’t. Let alone know how to pronounce it! The ‘j’ is pronounced like an ‘h’. But no matter how you say it you may be pleasantly surprised by it. 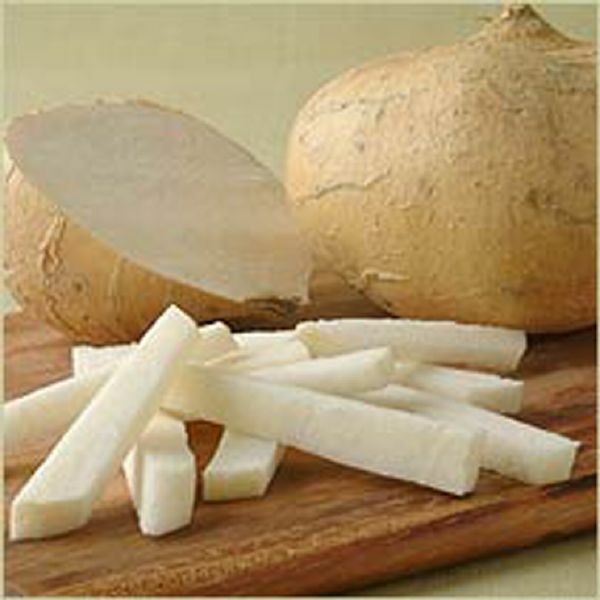 Jicama is sometimes called a Mexican turnip. It’s composed mostly of water so it’s also very low in calories! Bonus!! The taste is hard to describe. It’s crunchy with the texture of a potato or apple but sort of sweet and sort of earthy. Usually it’s found in salads. You can also fry it up like french fries! For this recipe I shredded it but you can also julienne it. It’s great with dip too. They are usually the size of a large grapefruit and can weigh a couple of pounds. Just peel the outside skin and slice it up! Try it!! Well I made this originally for a side to go with our rib dinner this weekend. I made it the night before which is advised so that the flavors can blend. It’s not a heavy mayo slaw either. I brought it over to a friend’s house tonight because we did have leftovers. This recipe makes quite a bit so share it! And I have to say even though my husband and I loved it we knew it was a hit when our friend Brad loved it! Then again, there isn’t much food that Brad doesn’t like! But really, he gave his thumbs up approval so we know we have a hit! Thanks Brad! I know there are many recipes out there that use jicama in a broccoli slaw but mine also has a slight Italian flavor to it. I used the new Breakstone’s Zesty Blends sour cream. They come in three flavors and I used the Roasted Garlic and Herb. Delicious! It’s great as a dip just as it is too! Great for dipping that extra jicama in! 1. Mix mayonnaise, sour cream, scallions and vinegar in a large bowl. Add the slaw and jicama and mix well. This is best if it is made the night before or several hours before using. I can personally attest that this broccoli slaw is the best!! And yes Brad loved it and keeps talking about it! I made this over the weekend. Yummy!